Scripture selection is Day 8 Period II. for April 26th are Joyful. thinks – how we are before God. God told them not to eat of the tree. "I am the slave of God"
Mary is a powerful intercessor. help build the Kingdom of God. but what we do before God. say "no" to God like Adam and Eve did. of Peace, please help us. Our Father, Who art in heaven, hallowed be Thy name. Thy Kingdom come, Thy will be done on earth as it is in heaven. Give us this day our daily bread and forgive us our trespasses as we forgive those who trespass against us. And lead us not into temptation, but deliver us from evil. Amen. it only lasts one moment. Hearing this, they were cut to the heart and said to Peter and the other apostles, ‘What are we to do, brothers?’ ‘You must repent,’ Peter answered, ‘and every one of you must be baptised in the name of Jesus Christ for the forgiveness of your sins, and you will receive the gift of the Holy Spirit. The promise that was made is for you and your children, and for all those who are far away, for all those whom the Lord our God is calling to himself.’ He spoke to them for a long time using many other arguments, and he urged them, ‘Save yourselves from this perverse generation.’ They accepted what he said and were baptised. That very day about three thousand were added to their number. In baptism we receive a sharing in His life. Our knowing and loving capacity is elevated. The supernatural world is opened to us. Our human nature is elevated in baptism. Let me be a holy sacrifice and unite with God in the sacrament of His greatest love. I want to be one in Him in this act of love, where He gives Himself to me and I give myself as a sacrifice to Him. Let me be a holy sacrifice as I become one with Him in this my act of greatest love to Him. 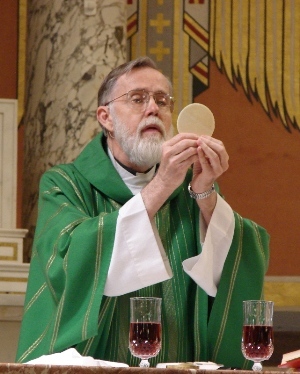 My dear Father, I offer you this day all my prayers, works, joys, and sufferings in union with Jesus in the Holy Sacrifice of the Mass throughout the world, in the Holy Spirit. I unite with our Mother, Mary, all the angels and saints, and all the souls in purgatory to pray to the Father for myself, for each member of my family, for my friends, for all people throughout the world, for all the souls in purgatory, and for all other intentions of the Sacred Heart. I love You, Jesus, and I give You my heart. I love you, Mary, and I give you my heart. Amen. My dear Father, I offer You this day all my prayers, works, joys and sufferings, my every breath, my every heartbeat, my every thought, all my actions, in union with Jesus in the Holy Sacrifice of the Mass throughout the world, in the Holy Spirit. I pray the Holy Spirit is with me every second today, enlightening me to do the Will of the Father and filling me with the fire of God's love. I ask Jesus and Mary to be one in me in all that I do and I unite with all the angels and saints and souls in purgatory to pray continually to the Father for these intercessions, in this prayer, for this day. For myself, I pray for grace-abundant grace, to know and love God more and more and to follow the Will of the Father. I pray to the Holy Spirit to transform me in the heart of Mary to be more and more like Jesus. I pray that I can forever dwell in the Hearts of Jesus and Mary. I pray for conversion of all those I hold dear who need conversion. I pray for each member of my family that they will be filled with Your abundant grace to grow in their knowledge and love of God. I pray for all my friends that they will receive abundant grace to carry out the great plan of the Father, that they will grow forever closer to Jesus' Heart through Mary's heart, that we will all be led by the Holy Spirit to do His work, that we will, together, carry out the plan of the Father as He intends us to, to spread the love of the Sacred Heart of Jesus and Mary's heart to this world. Jesus, I pray for myself so the Holy Spirit descends upon me and opens my heart to Your love so I will grow more and more deeply in union with You. I pray that I do not worry what other people think but try always to please the Father and do His Will. I pray that I may help lead many to Your burning love. 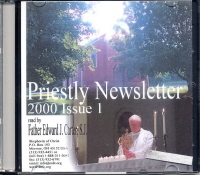 I pray for priests the world over, for the success of the Priestly Newsletter, the Chapters and for the finances needed for the Newsletter. I pray for the circulation of the Blue Book messages, rosary meditations and tapes. I pray for all those involved in the publication of these messages. I pray that You will shower Your abundant graces onto the priests reading the Newsletter the people reading and hearing the Blue Book messages and rosary meditations and all of Fr. Carter's publications. We pray for the intentions we hold deep within our hearts, for our families and friends, for those requesting our prayers. We pray for children the world over and for the souls in purgatory. We ask God to shower His abundant grace on us and the members of our Shepherds of Christ Chapter so that we may grow more and more in our knowledge and love of God. We consecrate ourselves to the Hearts of Jesus and Mary. 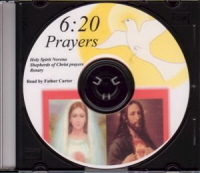 We pray for Father Carter, for Father Smith, for Rita Ring, and for John Weickert, for all leaders and helpers in the Shepherds of Christ Movement, for Shepherds of Christ Ministries, and Our Lady of Light Ministry. We pray for all those who are working in these ministries. We bind ourselves and our children and our friends to the Immaculate Heart of Mary. We place the precious blood of Jesus on ourselves, and all we touch, so that we will be protected from the evil one. We pray to St. Michael to cast the devil into hell. We love You, God, we love You, we love You. We beg that we may receive the grace to love You more and more deeply. We adore You, we praise You, our beloved Father, Son, and Holy Spirit.